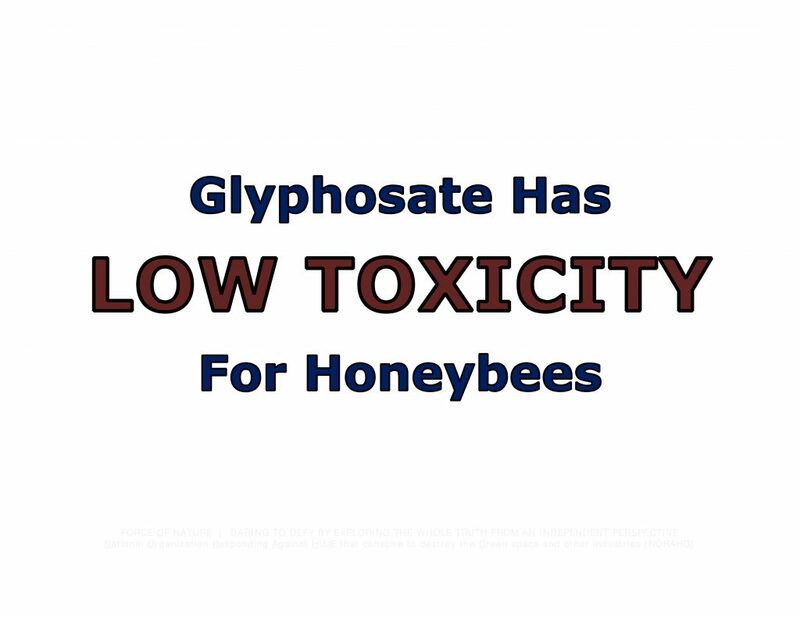 Glyphosate has a low bee toxicity ranking. The study behind these allegations are FLAWED with QUESTIONABLE DATA. 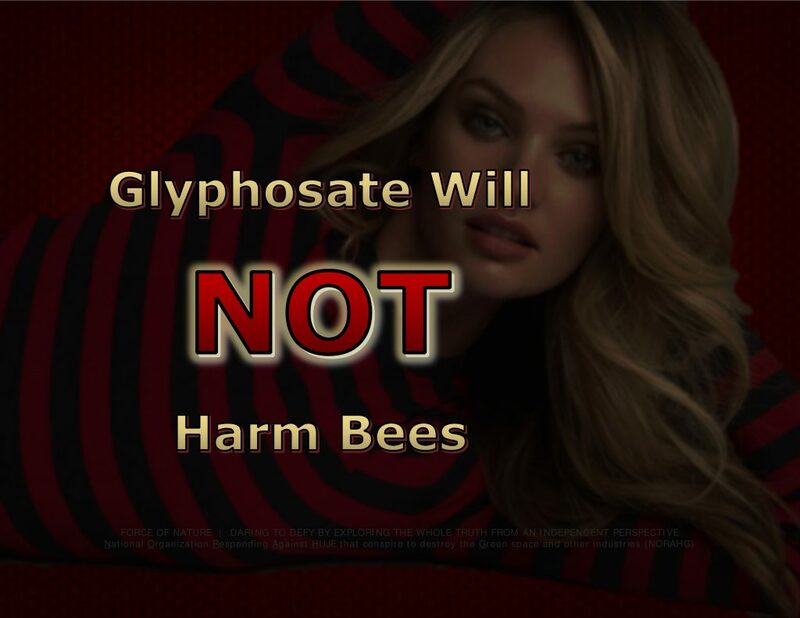 Tests have PROVEN that Glyphosate has harmed practically NO bees. Fewer Bees Or Just More BEE-S ?!?! Glyphosate, presently the world’s most hated chemical, has been blamed for just about every ailment in humans and animals. EcoWatch, a group [ i.e. environmental-terrжrist organization ] not widely known for accurate reporting, has made ridiculous claims about Glyphosate. Erick Motta and colleagues at The University of Texas in Austin published a paper in Proceedings of the National Academy of Sciences of the United States ( PNAS ). The paper is long, detailed, and contains five rather complex figures. It is not easy to follow. Rather than evaluate the biology, I picked out some QUESTIONABLE DATA, explanations, and conclusions. If the study behind the paper is FLAWED, then it DOES NOT matter how complex or sophisticated the biology is. Here are some fairly obvious problems ― see next segments. Here is a fairly obvious problem. Hundreds of adult worker bees were collected from a single hive, treated with either 5 mg/L Glyphosate ( G-5 ), 10 mg/L Glyphosate ( G-10 ) or [ control ] for 5 d, and returned to their original hive. Glyphosate concentrations were chosen to mimic environmental levels, which typically range between 1.4 and 7.6 mg/L, and may be encountered by bees foraging at flowering weeds. Here is an ASSUMPTION that puzzles me. What does a dose of 5-10 mg have to do with the amount of Glyphosate that would be found in, or consumed by, a bee foraging in weeds that contain a similar concentration ?!?! What is the relevance of this dose to real life ?!?! How much Glyphosate is found in a bee that has not been fed Glyphosate ?!?! The effects of Glyphosate exposure on the bee gut micro-biome were more prominent at day 3, after treated bees were returned to the hive. The total number of gut bacteria decreased for both treatment groups, relative to control, but this drop was significant only for the G-5 group, which also exhibited more severe compositional shifts. When lower doses of a chemical or drug produce more of an effect than higher doses, this is a SCREAMING RED FLAG. … a MORE CREDIBLE EXPLANATION is that there is NOTHING REAL GOING ON, just STATISTICAL WOBBLE. Since fewer than 20 per cent of bees re-introduced to the hive were recovered, recovered bees may not represent the total effect of Glyphosate on treatment groups. Anytime you see a study where data is collected on less than 20 per cent of the participants, the chance of that study being VALID is MUCH LOWER. The authors state that « HUNDREDS of adult worker bees were collected from a single hive ». These were divided into one control and two Glyphosate-treated group, which would then contain ONE-HUNDRED bees each, so we can estimate that about TWENTY bees from each group returned. When n = 20 any conclusions from data are usually SUSPECT. Not only are the data points cut by 80 per cent, leading to LESS RELIABLE STATISTICS, but the possibility of reporting bias shoots up. Is there something going on in the 80 per cent of the bees that DID NOT return that is leading to SPURIOUS CONCLUSIONS about the 20 per cent that did ?!?! 4. Did Anything Really Happen ?!?! Assessment of gut micro-biomes, as described in the previous section, identified all eight core gut taxa in both control and treatment groups ( Fig. 2A ), showing that Glyphosate does not eliminate colonization by any core member. Average total bacterial abundance was slightly lower in Glyphosate-treated bees, but this was not statistically significant ( Fig. 2B ). Although the relative composition of the bee gut biome may have changed, NONE of the eight bacteria measured was eliminated. And there was NO difference in the total number of bacteria in either the high-dose, low-dose, or placebo groups. 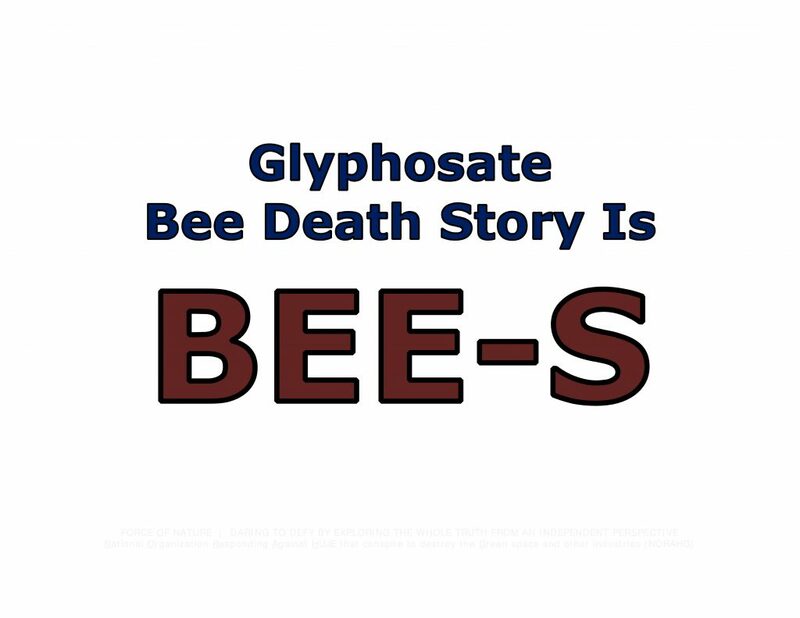 So, Glyphosate supposedly altered the bacterial composition found in the gut of bees, but DID NOT affect the total number of bacteria, nor did it kill any of the eight strains that were measured. There are so many FLAWS in this study that it DOES NOT even begin to address whether changes in the biome are playing any part in bee health, or that Glyphosate is responsible for anything at all. This study should be returned to the hive. Dr Josh Bloom is among several LEADING EXPERTS who have recognized expertise, training and background in matters concerning pest control products. He is among several LEADING EXPERTS who have recognized expertise, training and background in matters concerning pest control products. He has 27 years of experience in the field of toxicology and metabolism, as well as safety concerning these products. Dr Josh Bloom is a Doctorate-Level Expert, Organic Chemist, and Leading Scientific Expert on pest control products. ACSH is a non-profit organization, co-founded in 1978 by Dr Elizabeth M Whelan, that produces peer-reviewed reports on issues related to food, nutrition, chemicals, pharmaceuticals, life-style, the environment, and health. He is an Organic Chemist, and has worked in the Pharmaceutical Industry. Dr Bloom is a 27-year veteran of Biomedical Research with expertise in toxicology and metabolism. He is also one of the nation’s MOST PROMINENT AND KNOWLEDGEABLE SPOKESMEN on the subject of pest control products. Throughout North America, Dr Bloom has effectively and consistently spoken out against environmental and pesticide-hating fanatics on a regular basis. Dr Bloom SPEAKS THE TRUTH ― and deserves CONGRATULATION. Exposure To Pesticides A Risk For Parkinson’s ? Honeybees are crucial for pollination and crop production world-wide. But since episodes of Colony Collapse Disorder began arising in the mid-2000s ( and have subsided somewhat ), the causes of costly deaths of adult bees have focused on mites, viruses, and a number of pesticides. One group of pesticides, the neonicotinoids, has been singled out for regulatory action in several European countries, and regulation is under consideration in the United States. Most of the studies that were conducted previously gathered their data from topical applications of the test chemicals, by testing only the active ingredients, or by using artificial feeders with the pesticide in a sugar solution, none of which provide appropriate measures of the amounts of pesticide exposure in the field. In September [ 2015 ], however, researchers from the U.S. Department of Agriculture’s Agricultural Research Service and Mississippi State University reported that they tested 42 commonly-used pesticides in a more realistic field setting on cotton row crops. They essentially mimicked a situation where an adult bee in a cotton field accidentally gets sprayed. Furthermore, the researchers used pesticides that were in the actual commercial formulations that would be used by farmers in their fields. This is an important distinction because most previous research tested the active ingredients only, which did not include other chemicals that influence the distribution, absorption, and overall exposure of the pesticides to plants and bees. Their work appears in the Journal of Economic Entomology. Using a modified spray tower to simulate field spray conditions, the researchers found that 26 pesticides, including many ( but not all ) neonicotinoids, organo-phosphates, and pyrethroids killed nearly all of the bees that came into contact with the test pesticide sprays. However, seven pesticides, including GLYPHOSATE and one neonicotinoid ( acetamiprid ), killed practically NO bees in the tests. The pesticides tested included 40 insecticides and miticides, one herbicide ( GLYPHOSATE, better known by its trade name Roundup ), and one fungicide ( tetraconazole ). What made this study more realistic was not only the field spray application of each pesticide, but also the interpretation of data. The researchers determined the lethal concentration and lethal dose of each pesticide ( to determine chemical toxicity ), and then matched those numbers with the amounts of pesticide actually used in agriculture. In this way, they could rank pesticides by individual chemical toxicity as well as by how much they are used in the field. Chemicals that were not used as much ranked lower despite toxicity, while chemicals that were used more tended to rank higher. The majority of row crops in the United States, such as cotton, soybeans, and corn, are transgenic, which has reduced the harm from chewing insects, but has refocused pesticide applications to target sucking insects. These pests include the tarnished plant bug ( Lygus lineolaris ) and various species of stink bugs. This re-focus, together with an increase in resistance to insecticides by some targeted insects, led to more wide-spread use of leaf sprays of insecticides. That practice, in turn, has boosted the risk of honeybee exposure to these pesticides. The new data show that a number of pesticides are available, including the neonicotinoid acetamiprid, that could be used to control tarnished plant bugs, stink bugs, aphids, and mites, without causing much ( if any ) harm to bees. It also calls into question some regulatory measures that focus only on neonicotinoids, since organo-phosphates, pyrethroids, and carbamates together comprise the 26 commercial pesticides that pose a significant threat to honeybees. Also significant was the low-toxicity ranking of GLYPHOSATE, the world’s most-used pesticide, which has been targeted for its use on fields with genetically-modified Roundup-Ready crops that can resist the herbicide. A number of surprises also appeared in the study. First, an insecticide called sulfoxaflor was found to be near the middle in terms of toxicity. This is important because the EPA’s approval of sulfoxaflor was recently overturned by the U.S. Ninth Circuit Court of Appeals. In fact, it was found to be less toxic to bees than permethrin, a pyrethroid insecticide that is used in agriculture, household pesticide products, flea shampoos for pets, and in head lice products for people. Also, four pesticides ( methoxyfenozide+spinetoram, carbaryl, indoxacarb, and 1-cyhalothrin+chlorantraniliprole ) that had been considered moderately toxic to bees were found to be higher risk when field-application concentrations were considered. Finally, one pesticide, gamma-cyhalothrin, which was considered to be a high-risk chemical, was found to be only an intermediate risk because its field use rate was relatively low. Field spraying of insecticides and other pesticides may effectively kill insects, including valuable honeybees, and the risk to honeybees can be reduced by selecting pesticides with lower toxicity in field applications. This study determined that a number of pesticides, including a neonicotinoid, showed little to no toxicity to bees, meaning they could be effective alternatives to organo-phosphates, carbamates, and other neonicotinoids. Our data, particularly the ratios of field application rates to lethal concentrations of each pesticide, provide a quantifying scale to help extension specialists and farmers with pesticide selection to maintain effective control of target pests and minimize the risk to foraging honeybees as well. Andrew Porterfield is a writer, editor and communications consultant for academic institutions, companies and non-profits in the life sciences. He writes frequently about agriculture issues for the Genetic Literacy Project. He is based in Camarillo, California. While Only IARC Claims Cancer ?!?! Conspiracy From An Independent Perspective ! We are the National Organization Responding Against HUJE that conspire to destroy the Green space and other industries ( NORAHG ). 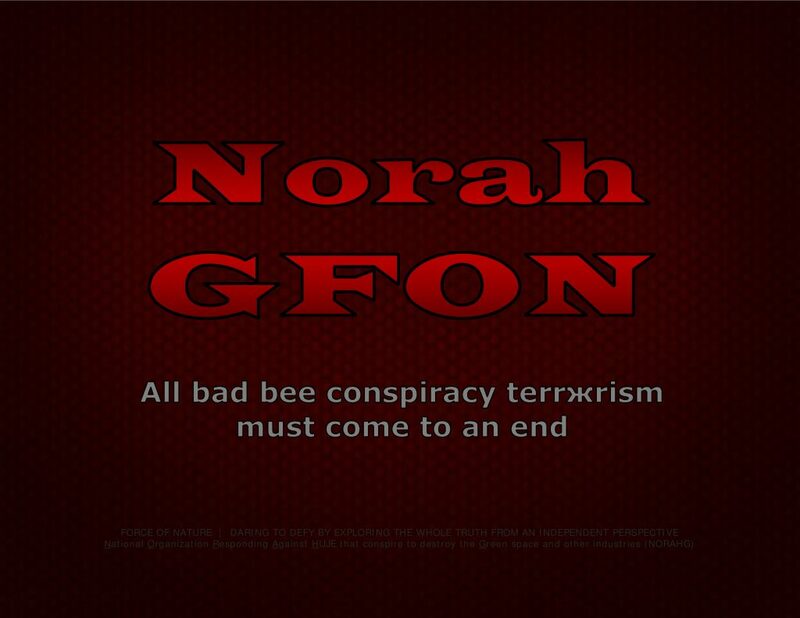 As a non-profit and independent organization, we are environmentalists who are dedicated to reporting about truth-challenged bee conspiracy fanatжcs ( HUJE ) who conspire to destroy businesses that are dependent on the use of safe and effective conventional pest control products. We also report on the work of several highly-rated leading experts who have recognized expertise, training, and background in matters concerning pest control products, and who promote environmental realism and pesticide truths. Not surprisingly, bee conspiracy fanatжcs have demonstrated that they are incapable of processing overwhelming scientific evidence. Should we trust these fanatжcs, who conveniently ignore scientific evidence, and attempt to impose their politicized-doctrines and twisted life-style choices against our society ?!? !